What Is Going On In The Yankees Front Office? 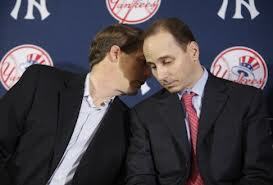 Who is really running the show, Hal Steinbrenner or Brian Cashman? The Yankees front office seems to be taking a page from Alex Rodriguez these days, as they continue to make headlines for all the wrong reasons. Private conversations and personnel decisions have been becoming more and more public recently, which is leaving many to question if ownership and Brian Cashman are on the same page. Before yesterday’s game, Joe Girardi told reporters Derek Jeter would be playing in a simulated game before deciding if he was ready to rejoin the team. But, he would not reveal the location. This has many asking the obvious question, Why not? What does protecting the location of a simulated game really accomplish? This comes off as odd to me and has me curious who made the decision to not inform the media where the game would be held. It’s not like an army of reporters would have quickly fled to Staten Island, where the game was actually held, to watch Jeter. Even if they did, what was the worst that was going to happen, he gets asked how he felt and if he is ready to rejoin the team? Pretty sure Jeter would have been able to handle these minuscule questions. Ownership overruling Cashman is nothing new, just think back to when the Alex Rodriguez extension was forced upon him. The move for Soriano cost them pitching prospect Corey Black. It’s not like Black was being regarded as a big piece of the future for this franchise. In my opinion, this was Cashman venting a little bit as his frustration is beginning o catch up with him. It was well documented that ownership wanted to have the Yankees below the Luxury tax and restock from within, but this move says otherwise. If George was still around, no one would even think twice about this move. He would willingly take a chance on such a player without blinking. If it didn’t work out? So what, move on and go sign someone else. Those days were suppose to be behind us. Cashman was supposed to be the one making decisions now, but you have to be doubting that after this recent power struggle. This season has been one giant headache for Cashman, and if ownership continues to run this team in such a manner, it might be best if these two part ways at the end of the season.